Saving too much… really, is that a possibility that people are even remotely concerned about? Or is it just a meme used to justify an expensive third decade? I love Morningstar, I really do. My respect for the company is one of the reasons I had a particularly exaggerated eye-rolling session upon reading Morningstar’s report that some Americans, horror of horrors, might be saving too much for their impending retirements. Woe are the retirees who find themselves with more money than they otherwise would have needed and have to deal with first world problems like end of life planning, large estates, and charitable giving. I kid, but I’m completely serious when I say that the majority of investors should read a piece like that, nod their collective heads, and go back to increasing their own savings rate – saving too much isn’t just going to sneak up on you. Let’s explore why that’s the case! Likeness of a Typical American. You know what BMI’s good for? The average, typical, everyday, normal citizen of the United States. That also makes it tremendous for comparing health across massive populations such as… the world. BMI correlated with all sorts of diseases – diabetes status and heart health among the most important (with higher BMIs being negative for health). After reading those two paragraphs, people will have one of two reactions: they will either nod along and say, “hey, that’s pretty useful!”. Another type of person will instead concentrate on my very first sentence and say “BMI is useless”. You know what? It can be pretty useless for a certain subject of people. Bodybuilders, powerlifters, short distance track athletes, certain professional and amateur team sport players (particularly in football and hockey) and other athletic individuals such as soldiers can get some absurd readings when concentrating on BMI. On the flip side, some rail thin people may never leave the couch and have horrible health! With a grin, other typical everyday citizens love to point out these amazing pieces of health trivia. In a country with a median male bicep circumference around 13.3 inches (not at all good when you consider a median waist of 39.133″!) BMI is great. If the grinning troll lecturing you about the BMI is a powerlifter or soldier or something, concede them the point – BMI would certainly fail them. I mean, your 5’10” 186 lb author is even overweight by BMI standards – but our 32″ waist snaps us back to reality. Here’s the thing. If BMI doesn’t apply to you, you already know it. When your doctor performs your annual physical and sees a 6 pack, they’re not going to tell you to watch your weight. Basically, even though a point can be made that some people are poorly served by some rule of thumb doesn’t automatically mean that you can toss the rule of thumb out the window. The maybe 5% of people BMI doesn’t apply to already know it, and those people aren’t going to adjust their behavior to fit the model of the everyday citizens any more than the everyday citizens are going to follow through on their 2014 Resolutions and lift weights past January 31st. The Morningstar piece, just like some of our greatest hits such as our American household food spending or savings calculators uses data from the Consumer Expenditure Survey. You know who makes up that survey? You shouldn’t be surprised to learn it’s average, typical, everyday, normal citizens of the United States – specifically chosen from a variety of demographics to accurately model the population as a whole. The average citizen also happens to undersave, plan poorly, get forced into retirement too early, and inaccurately model risks. That means that the data, whether pulled from the Consumer Expenditure Survey, or later in the study from the Rand HRS longitudinal data set is going to comprise people who mostly fit that mold. Saving too much isn’t a common ailment for this crew. Look, I don’t know if there is a Peter Principal for money, but with the number of times I read about hedonic treadmills I know that lifestyle inflation is a thing. So too must exist lifestyle deflation – if I cap the amount of money in a typical retiree household from Social Security because a person didn’t save enough money during their working career, it doesn’t take an advanced degree to expect their spending to drop. It doesn’t matter if they were making $200,000,000 a year for their entire career… they will have to adjust to the reduction in cash flow. And if they don’t? Reference Herbert Stein’s eponymous law: “Things that can’t continue, won’t”. So, yes, just like you can name a few people who avoided the general reduction in muscle mass and increase in adipose tissue post-college, there will surely be some people who save more money than the absolutely minimum that they could have gotten away with. Those people will have something horrible happen to them – they will die with non-zero account balances, and do disgusting things like ensure the continued wealth of their progeny and donate to causes that they enjoyed during their lives. Other people will reduce their spending because, hey, less cash is coming in. There are a lot more people in the latter group than the former. Odds are that BMI applies to you and you’re not saving enough for retirement. Come back in a year, tell me how you saved 30% of your net income and worked out the whole year – we can then debate the finer points of skinfold tests, hydrostatic weighting, and DXA analysis along with your portfolio allocation. Until then, go increase your savings rate; you’re not saving too much. See you in 2045. We have a trophy like that at home, alas, Mr PoP was not the one who earned it. Though perhaps we’d be in the running if it were for financial body building – I don’t think you’d yell at us for our savings rate this month. 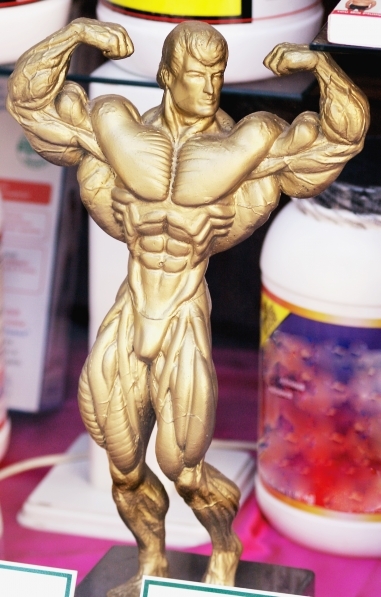 Haha, I wonder what the Personal Finance equivalent of a Bodybuilding trophy is… framed student loan payoff statement? First dollar bill earned at a home business… on the wall? Good analysis as always. Reminds me of a similar “embarrassment of riches” argument in Canada. The Registered Retirement Savings Plan (RRSP, akin to the 401k I think) provides taxable income to retirees. This, however, occurs after deducting the deposit from one’s taxable income up-front and possibly decades of tax-free growth. I’ve read a couple times on Garth Turner’s blog (he’s a big deal in the Arctic) that one should stick to TFSAs (Roth IRA?) and eschew RRSPs. I’d prefer to go with both, and I’m not concerned about the eventuality of paying taxes on RRSP withdrawals in 40 years. Roth is the ‘pay tax now and we promise not to charge income tax’ plan, Traditional is the ‘don’t worry about it, we’ll get you later’ plan. IRAs and 401(k)s are two separate forms of accounts here, and the 401(k) is generally from your employer while the IRA is uncoupled. I’ve been puzzled by the arguments about BMI. It seems a fairly common thing for people to declare that BMI is invalid or doesn’t work or faulty etc. Yet it seems kinda obvious to me that its a rule of thumb measure not meant for NFL running backs. Yet some people seem really REALLY adamant that its a flawed. I find it pretty puzzling too – and of all the times I’ve heard the argument, maybe one or two times it was from someone who it would poorly serve. Actually, I bet my 5% ‘inapplicable’ estimate is too high – it’s probably close to that for certain populations, but I doubt that it’s that high across the whole US. Maybe I should dig deeper into that CDC report, haha. Saving too much for retirement? I wish I had that problem! You know, I’ve often thought about both of these concepts — how BMI is a crude measurement that equates “muscle weight” with “fat weight” as though they were the same, AND how rules-of-thumb about retirement planning are not the end of the story. With regard to BMI, as you said, if you’re in the minority of people who have so much muscle that you tip the scales as “overweight” even though you have a 6-pack … you already know that the rudimentary scale doesn’t apply to you. And if you’re saving too much for retirement, you’ve also probably thought about that, as well. For example: I’m “saving too much” for retirement, by most measures, since my savings rate far exceeds what most experts would recommend. But most experts also assume that I’ll work until I’m at least 55 or 60, if not 62 or older. What if I wanted to “quit my day job” (hehehe) at age 35? What then? Let’s say, for example, that at age 35, I had enough money through other (non-retirement) investments to live on, but not enough to continue making significant retirement contributions. Wouldn’t it be an awesome thing that I invested so heavily during my 20’s? In that regard, the “saving too much” argument doesn’t apply to me, since there’s no way for me to guarantee what my goals/priorities/ambitions will be in the future. Don’t forget all the weird technicality weights – water (also known as the goto excuse for people when they cheat on their diet but want to say they are still working out) and glycogen. I completely agree with you, on all fronts. If you want to quit your day job, are you really going to yell at your 25 year old self and say “hey, we could have done it for $10,000 cheaper – you saved too much money!”? Doubt it. Having too much left over is a good problem to have, and one I would surely trade for the opposite – too sick or tired to work, but not enough money to retire. I guess the only counterargument would be if you could honestly say, at 35, that the extra x% you saved as a 2# year old (or 30-34 year old?) would have better been spent doing some activity as a 2# year old than a 35 year old. Of course, with age comes wisdom – and it’s better to look forward to a life of doing whatever you want than looking back at a crazy set of years in your early twenties (and the debt to remind you), and hope for retirement. In every showdown of that formula? I’ll take the rich 35 year old. The median waste size is 39″?? I’m feeling good now! My 14 year old jeans are starting to fray at the bottom though. Might have to pony up for some new ones! I don’t think we can save too much at all. Will have to check out that post. Yep – scary stat to be a nation with waists three times the size of our arms. How do you flex a belt? You really don’t have more money than you think, no matter what banks tell you (e.g. Scotiabank in Canada is trying to convince people they have more money). You can never save too much, but you can lose sight of what life is really about (read: not hoarding money and refusing to spend or enjoy it) which I suppose is the aftermath of “saving too much”.